Prayer was offered by President C. F. Middleton. The choir sang: “Thou doest not weep to weep alone,” etc. The Bishop then stated that previous to the death of the deceased he had requested that Elders Lorin Farr, and L.J. Herrick, and Apostle F. D. Richards act as speakers at his funeral. Those brethren are all present and would address the meeting. Elder Lorin Farr was the first speaker. He said that we are reminded by the circumstances that have called us together that this earth and this state of existence are not our permanent condition and abiding-place, but that all must undergo a change. We have been called upon today, to pay our last respects to the mortal remains of our brother, but not our last respects to him, for he still lives and we shall meet him again in another sphere and better condition than we now experience. He then spoke of the object of man coming to the earth, namely to work out a more exceeding weight of glory and exaltation than we otherwise could and said this is the most important age of the world in which the Lord has ever spoken to man on the earth, as it is the dispensation of the fullness of times, when God will gather all things into one and the restitution of all things spoken by the Prophets. The speaker next contrasted the religion of the world with that of the Church of Jesus Christ of Latter-day Saints and showed that the latter was the only true order of the Kingdom of God which He has established upon the earth in the last days. This is the Gospel which our brother, whose remains lie before us, had embraced and to which he remained faithful while he lived in this state of existence, he spoke of the great events that are transpiring and of the opposition of mankind to this great work, but it will triumph and God will give the victory to all who maintain their integrity. Our brother was such an one, he held the high Melchisedek Priesthood and magnified it to the end of his life. He has kept his covenants that entitle him to go into the presence of God and to associate with Abraham, Isaac, Jacob, Joseph, Hyrum, and others in the spirit world, and can also labor there and preach to the spirits in prison, for he carries with him the keys and the watchword authorizing him to do these things and entitle him to the blessings of associating with his former wife and friends who have gone before him. His mind, in this life, was always engaged in, and contemplating this great work of God. For these reasons his family and friends have little cause to mourn his departure from this life. He will, ere long, return again and if faithful will have the privilege to live and enjoy society here again. Elder Lester J. Herrick was the next speaker. His failing health prevented him from speaking so loud, or as much as he otherwise could desire. He could endorse all that had been said by Elder Farr upon this subject. He, like many men, believed that if, when we depart, this is the end of man he would be in a miserable condition. But this is not true, for he looked forward to the time when he should again meet and hold converse with Father Eggleston in the future, as he has done in the past; for death is the passport to eternal life. Hence, when he can no longer enjoy life and be no longer useful to his fellow-man here, he does not desire to linger in pain and suffering, but he desires to have his lamp trimmed and burning and ready, when the time of his departure comes for he expects to meet his father, mother, and other friends, and enjoy a good and happy time with them. He had known the deceased from the time he first came here, and spoke of him in the highest term of commendation, both as a man, a citizen, and a servant of God. His place was made with him, he was reconciled to Him, and he died with a feeling of peace towards God and his brethren and sisters, for he has fought the good fight, kept the faith, and has overcome the world, death and the grave, and has entered into eternal life. Elder Herrick reminded the people that it was necessary to observe the things of the present life, to prepare for full enjoyment of the life to come. Apostle F. D. Richards next addressed the meeting. He had visited the deceased, a short time before his death, and found that, although his voice was weak, his spirit was strong, bright and lively and he could converse on the things of God as freshly and intelligently as he ever did, and thus his faculties remained bright to the last. He then said to the friends of the deceased that there lies before us a rich man; for he is rich in the things of the Kingdom of God. He felt that it was possible that Brother Eggleston could have been kept alive a short time longer, yet his system was worn out and it seemed wisdom in the Lord to take him. He said that the deceased had fought the good fight and kept the faith, and had entered into life. He exhorted the widow and the children to observe the counsels of their husband and father, for this was his special desire before he died. He has gone to prepare a place for you, and if you are faithful you will inherit it with him. The speaker then read a part of the 20th Chapter of Luke, in relation to the question of the Sadducees concerning the woman who had seven husbands in this life but died without issue. “Whose wife shall she be?” The speaker then explained the nature of the resurrection in which it is said there is “neither marrying nor giving in marriage” etc. and showed that this referred to those who heard the Gospel, but refused to obey it here in the flesh, who persecuted the servants and Saints of God and put them to death, that it applied to those who attain to the Telestial glory. They are cut off from marrying or giving in marriage in their resurrection. But there is nothing said in the revelations of God that will debar the righteous from the enjoyment of all these blessings either here, in this life or in the resurrection of the just. Brother Eggleston is one of those who are entitled to the highest glories to which the righteous attain, for he has honored every law of God that has come to his knowledge, as far as he has been able to do so; and if his widow, sons, daughters and other posterity are faithful they will enjoy these blessings and honors with him at the coming of the Son of God and will still go forward, increasing in the knowledge of the things of the Celestial Kingdom of God. He referred to the abundance of heavenly blessings bestowed upon the Church in our day, the existence of two Temples in which the people may labor for their eternal interests of the living and of their dead, with another nearing completion. How lavishly the Lord bestows his favor upon his people in multiplying his great blessings upon us, in giving us as many of the ordinances which tend to our exaltation if rightly appreciated and to our increase of knowledge and understanding in all His statutes, ordinances and judgements. He closed by exhorting the Saints to be faithful in all things, that they may be partakers of these great blessings. Bishop Robert McQuarrie said we had just parted with a good, kind and faithful man. He was blessed of the Lord, was spiritually-minded, and blessed with the visions of the Lord to a great degree. He was a good counselor, while united with the speaker and the other counselor. There were never any jars or discords between them, but they always labored together in harmony and in peace for the building up of the Kingdom of God in the Ward over which they had the watchcare. The choir sang a funeral hymn: “Brother, thou art gone before us.”The services closed by benediction by President L. W. Shurtliff, after which the remains were conveyed to the cemetery and consigned to rest. 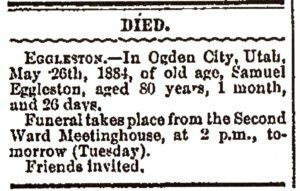 The deceased, Samuel Eggleston, was the son of Samuel and Elizabeth H. Eggleston. He was born at Marcellus, New York, March 30th, 1801. In 1817, he moved with his father, and family to Springwater, in the same State. When 19 years old, he left home and went to Sempronius and took up his abode with Thomas Marsh, his brother-in-law, with whom he remained four years. On the 23rd of August, 1827, he was married to Miss Lurania P. Burgess by Mr. Gordon, a Baptist minister, to whose church he then belonged. He had previously belonged to the Close Communion Baptists. He subsequently joined the Freewill Baptists. He became dissatisfied with them and held himself aloof from Christian institutions for a long time. 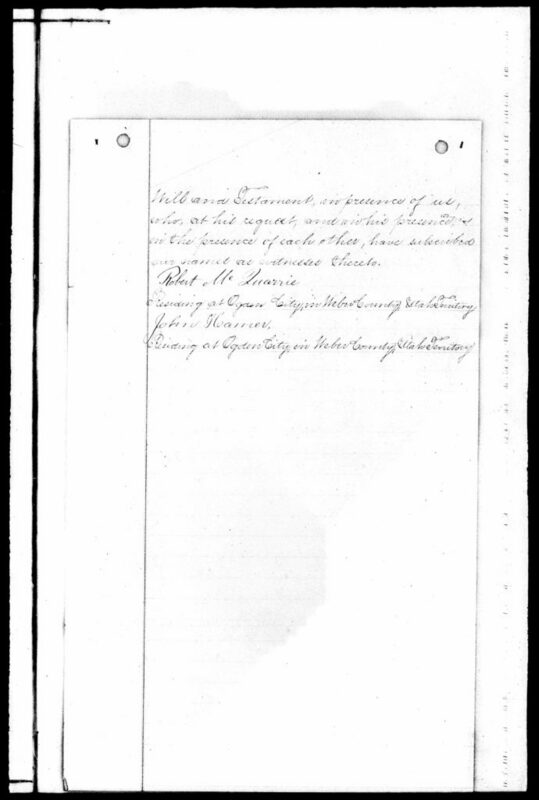 On the 6th of June,1841 he was baptized into the Church of Jesus Christ of Latter-day Saints by Elder Pelatiah Brown. On the 18th day of July following, he was ordained a Teacher by Dr. Willard Richards. In July, 1842, he removed with his family to Nauvoo. In October, 1844, he was ordained a member of the 9th Quorum of Seventies. Brother Eggleston and family remained at Nauvoo till the year 1846, when he shared in the exodus from that city. He went to Winter Quarters and stayed there till 1848 when he moved back to the east side of the Missouri River. In the spring of 1851, he went to Council Bluffs, Iowa. While in the latter State he was Justice of the Peace for ten years, Notary Public for nine years, and Deputy Postmaster for five years. 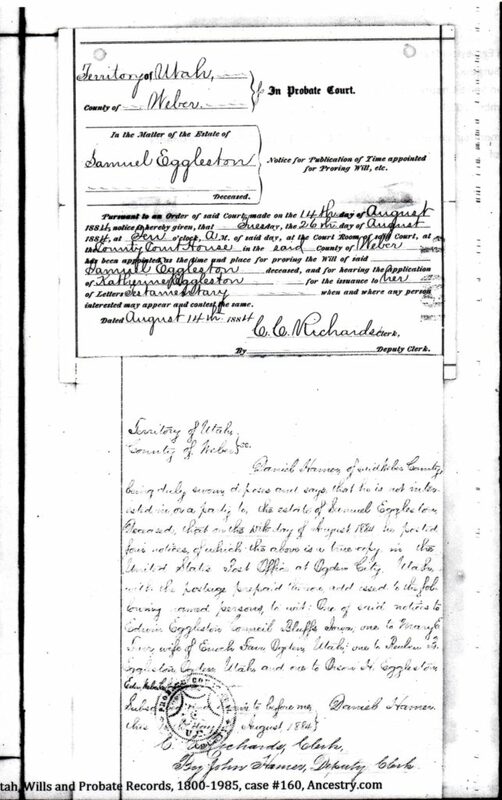 In 1862, he came to Utah, settling in Ogden. In 1863, he was ordained a high Priest by F. A. Hammond and others. On May 30, 1877, he was set apart as First Counselor to Robert McQuarrie, Bishop of the Second Ward of this city, which position he held until he died. On the 24th of October, 1882, he was ordained a Patriarch under the hands of President George Q. Cannon and others. The deceased Patriarch leaves four children, living (four having died); and twenty-seven grandchildren, (eleven more being dead) to build up his house and perpetuate his name in Israel. Peace to his ashes. 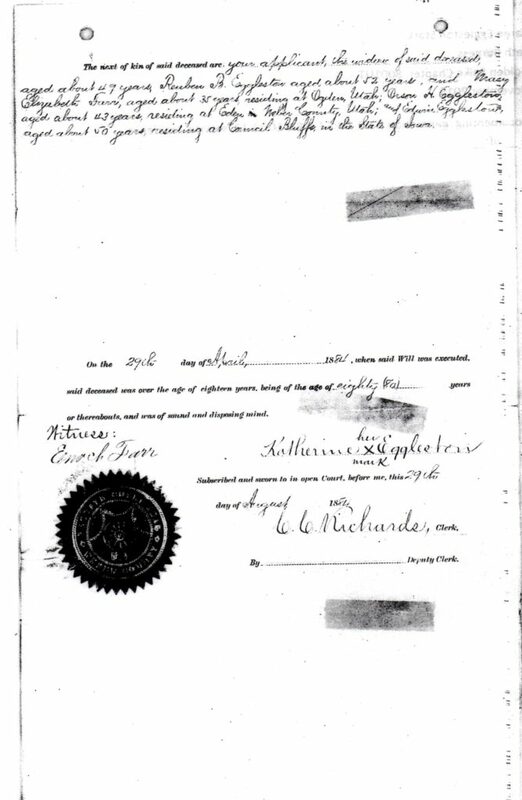 First, I give and bequeath to my son, Edwin Eggleston who resides at Council Bluffs, in the State of Iowa the sum of ten (10) Dollars to be paid from the sale of any estate. Secondly, I give and bequeath to my daughter Mary Elizabeth Farr, wife of Enoch Farr, the feather bed now used by me, and which was used by her mother during her lifetime. Thirdly, I give and bequeath to my wife Katherine Eggleston, absolutely, all the personal property of every kind and nature, owned by me at the time of my death. Fourthly, wishing to provide for the support and maintenance of my beloved wife Katherine Eggleston as long as she may live, and in a suitable a manner as the condition of my estate will provide. I give and devise to my said wife for her separate sole use and benefit so long as she may live, the use occupancy and control of all of my real estate of every name and nature whatsoever, owned by me at the time of my death and all rents, issues and profits, which may arise therefrom during her lifetime. Fiftly, At the death of my said wife, Katherine Eggleston, I give and devise to my sons Reuben B. Eggleston, Orson H. Eggleston and to my daughter Mary Elizabeth Farr, wife of Enoch Farr, all the real estate of every name and nature whatsoever, owned by me at the time of my death, to be divided equally between them, share and share alike. Lastly, I hereby enumerate and appoint my wife, Katherine Eggleston, of Ogden City aforesaid, the Executrix of this my Last Will and Testament, and hereby revoke all former Wills by me made. In Witness whereof I have hereunto set my hand and seal, this Twenty Seventh day of April in the year of our Lord one thousand eight hundred and eighty four. 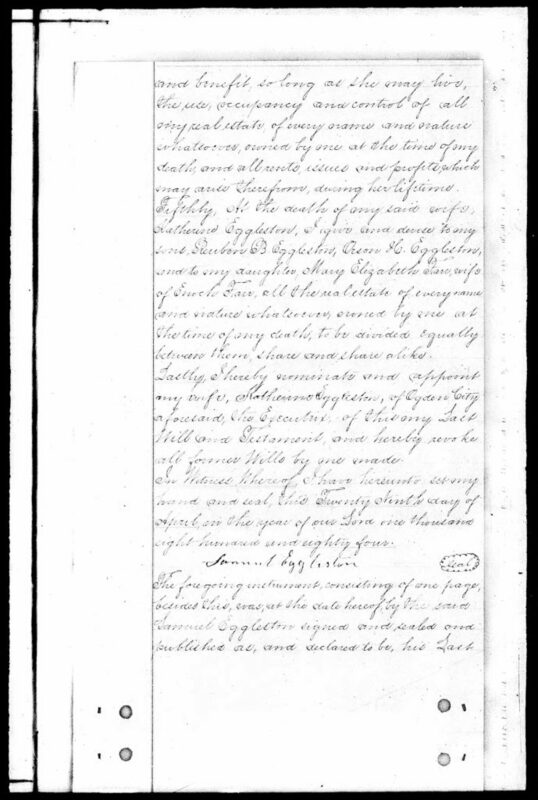 The foregoing instrument, consisting of one page, besides this, was at the date hereof by the said Samuel Eggleston signed and sealed and published as, and declared to be his last Will and Testament, in presence of us, who at his request, and in his presence, in the presence of each other, have subscribed and signed as witnesses thereto. The Official Probate Packet is rather large, containing several documents. 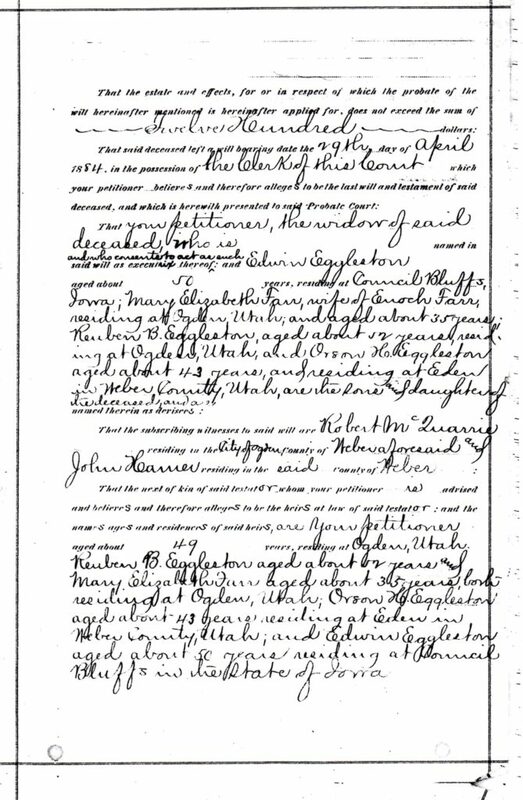 It lists heirs as Samuel’s widow, Katherine Eggleston, children Edwin Eggleston, age 50 of Council Bluffs, Iowa, Mary Farr, age 35, wife of Enoch Farr, of Ogden, Utah, Reuben B. Eggleston, age 52 of Ogden, Utah and Orson H. Eggleston, age 43 of Eden, Utah. Katherine was 49 years old and the petitioner. 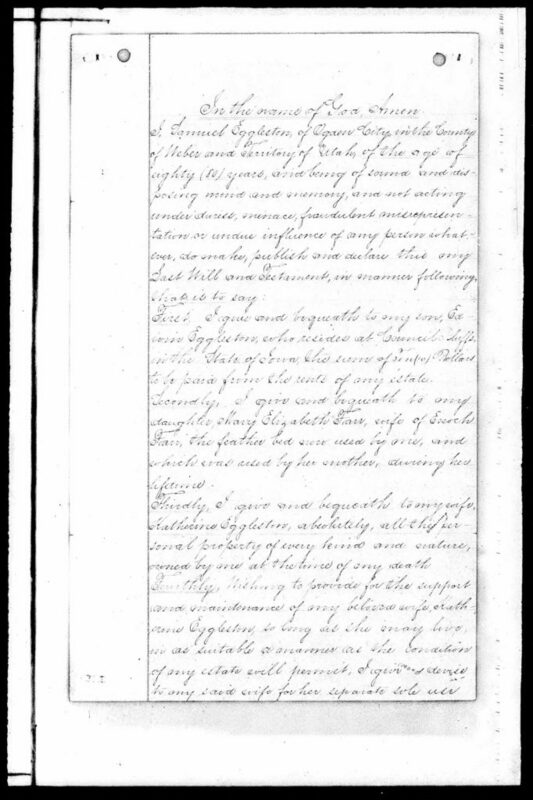 A part of Lot 3 in Block 20 in Plat A of Ogden city Survey in said Weber County, bounded as bollows: Beginning at a point 40 feet West of the South East corner of said Lot, and running thence West 52 feet, thence North 20 rods, thence East 52 feet, thence South 20 rods to the place of beginning – the homestead of the deceased, with house and improvements hereon, valued at about $1000.00. Sundry household goods and effects valued at about $50.00. The property was later appraised and valued at $800, plus the $50 personal property. 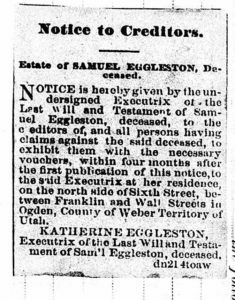 A Notice to Creditors which was published after Samuel’s death placed this property on the north side of Sixth Street (now 26th St.), between Franklin and Wall Streets. Franklin is now Lincoln Ave., so his home would have been on the north side of 26th St. between Lincoln and Wall Ave.
Catherine was executrix of Samuel’s will and the provisions in the will were for her to remain in their home as long as she lived. Upon her death in 1888, Reuben petitioned the Court to administer the estate. 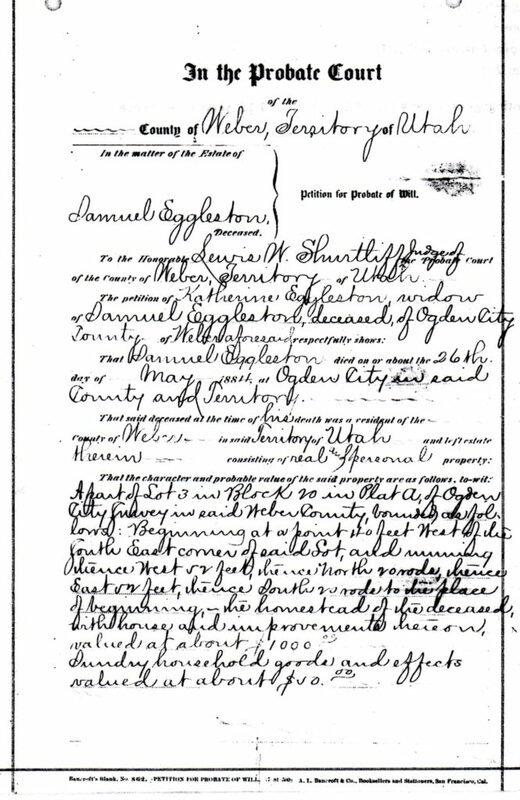 The property was appraised again and valued at $2000 on June 27, 1889. The household goods which were given to Catherine after Samuel’s death became part of her estate. Edwin received his $10 and Mary Farr the feather bed. The real estate was divided equally between Reuben, Orson and Mary. This entry was posted in Biographies and tagged Eggleston, Illinois, Iowa, New York, Utah. Bookmark the permalink. Karen, I am in awe of your research and am truly grateful for your sharing it with all of us.